Mexicanos en Holanda por la Paz en México: Day of the Dead 2012: Altar in memory of Mexico's Killed Journalists in Casa Migrante, Amsterdam. 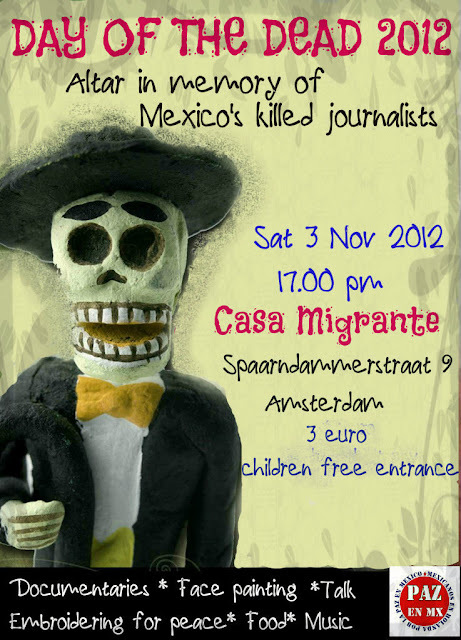 Day of the Dead 2012: Altar in memory of Mexico's Killed Journalists in Casa Migrante, Amsterdam. back to, eat and rejoice in their celebration. This is how we celebrate and welcome our beloved that were once with us. The group of Mexicans in the Netherlands for peace in Mexico take this opportunity to remember our dead and speak about peace, love and justice for them and their families. This year we want to honor the 72 journalist who have died in México during the past six years. We want to honor their work and let them know we have not forgotten them. Let's name the dead so everyone knows they once lived here and that we hold a big "debt of peace and justice owed to them and ourselves, so the whole of Mexico knows that no citizen will ever again allow a political project to be built on hate, corruption, impunity, war and death" (Sicilia 2011).